Thank Youuuuuu! We are so thrilled to hear you were able to love our home the way we do. As the city’s first boutique hotels we have such an opportunity to personalize the guest stay and are thrilled to hear guests are enjoying their experience! We will definitely celebrate Jose VV and let him know that we are happy with is performance. We look forward to welcoming you back to Elita or any of our Gzella Collection Properties. The only drawback was that on 2 days the common area/coffee/water was never replenished. The beach is at the corner, the hotel was super quiet and the beach towels/chairs and umbrella available form the hotel was great! We actually did not rent a car this trip and used UBER. Jose provided great eating/drinking tips! We booked the Penthouse Suite which sleeps 6 and after checking in learned that it only has 1 bathroom! And guess where the 1 bathroom is located? In one of the bedrooms! We ended up having to rent another room even though we already paid for the penthouse! And besides all this, there hardly is anyone at the front desk and when they were there, they were not very helpful. I would not recommend them and certainly never stay there again. Dear guest, we appreciate feedback that helps us advance our guest's experience! We apologize for the difficulties you encountered with your room, and for the inconvenience it caused. We like to offer the guest information about the room type if we were given the opportunity to give a brief description about the room type you booked. We will pass your informative review to the appropriate departments and want to thank you for being our guest. I discovered Elita Hotel online while searching for lodging for my wife and I for a winter escape. The pics and the reviews were excellent so we booked. We were exceptionally happy with the choice. We loved that it was small and private and quiet. All of the staff were extremely friendly and helpful. Customer service is clearly a high priority! The room was clean and updated, spacious. The grounds were impeccably manicured. It was a half block to the beach, literally a one minute walk and the 2nd floor sun deck had a great view of the Atlantic. 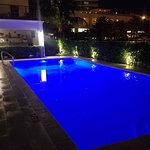 The pool was clean and heated and looked amazing lit up at night. We will absolutely return, we are already trying to justify a return in early winter! We traveled with our boys 13 and 9 years old and stayed our first 2 nights in FL at Elita - fantastic way to start our trip celebrating February birthdays for my husband and me as well as our anniversary. 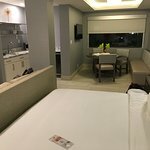 We arrived after 9pm from our flight and were pleasantly surprised by our GIANT room - a king size bed with a bathroom, nice kitchen and seating area and a separate room with double beds as well as a second bathroom! There was also a wonderful welcoming display with a "Happy Birthday" sign, a "Happy Anniversary" sign, 2 Elita t-shirts, a bottle of wine and candy! We were blown away by the unexpected and generous gesture. 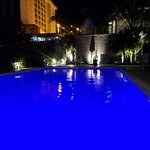 The grounds are lovely and the pool changes color at night - very cool. There are free snacks available throughout the day as well as water poolside. The location is a very easy couple of minute walk to the beach. We would DEFINITELY stay at Elita again and have already recommended it to friends. 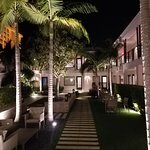 We left Ft Lauderdale to stay at a resort in Hollywood that was considerably more per day and had resort and parking fees, any snacks were way over priced, it was much more hectic and we had two double beds! While the building was located right on the beach - it took as long or longer to take an elevator to the lobby and walk through to get to the pool or ocean as it did to walk to the beach at Elita. I would be remiss if I did not mention Ilona who was wonderful and epitomized warm, caring customer service. Absolutely highly recommend as a place for our wedding guests to stay. Clean, amazing location, reasonable price, what more could you want!!! Ilona was incredibly easy to work with and very responsive. Highly highly recommend!! !